Dubai, UAE, January 08, 2019: Everyone loves how festive their homes look during the Christmas period, but January can tend to find you itching for a clean slate and a fresh start, especially with everything appearing a little dull without the holiday glitz. 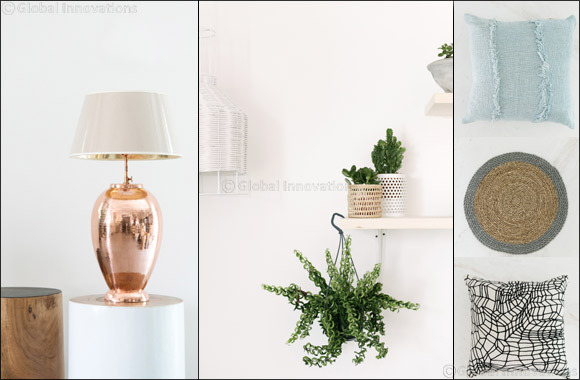 As we wave goodbye to 2018 and all the trends and colours that come with it, we are welcoming 2019 with renewed enthusiasm and a craving for fresh aesthetics, with a little help from our friends at Home and Soul Dubai. Home and Soul Dubai, the unique lifestyle retail concept store, is truly your one-stop-shop for all things interiors and the perfect destination to pick up a few key items that will help add a touch of freshness to your home without breaking the bank. From beautiful lighting and decorative mirrors to greenery and statements chairs, each item has been beautifully designed to befit any home, whatever the size. 1. Bring in some light: a simple way to refresh any room is replacing your current lamp with a new one. A new lamp base or a floor lamp can transform the room and really brighten the entire space. 2. Enliven any room with a rug: you can instantly create a visual interest and add an artistic touch to any room with the help of a rug. Bring in new colour, texture and pattern that reflects your style and personality, while enjoying its comfort and coziness. 3. Add greenery: Indoor oversized pots with an abundance of greenery are always a wonderful, cost effective way to liven up a space. Cluster the plants in group, at varying different heights for an abundant look. 4. Reposition and reset: rearranging your furniture is the greener, cheaper and simpler way to refresh your rooms. In just a few simple movements you can transform the ambience of a room and make a huge impact. 5. Luxuriate with new cushions: an affordable and gorgeously indulgent way to refresh your home for the new year is by adding new cushions to your seating areas. It allows you to introduce a new accent colour to your d�cor or rich, tactile textures, setting the tone of the whole interior.